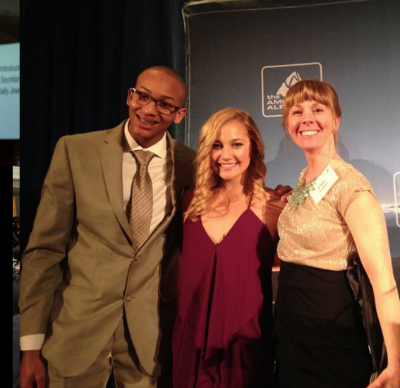 Left to Right: Kai Lightner, Sasha DiGiulian, Libby Sauter at last year's Annual Dinner. We're excited to confirm three panels and presentations that will take place on February 25, 2017 at our Annual Dinner in Seattle, WA. AAC Education has been endeavoring to educate climbers for over a century, but rarely have all the disparate voices in climber education coalesced into a single mediated conversation. Today, more than at any point in climbing history, the American climber hungers for information, and a myriad of voices presume to fulfill their appetites. At this special moment in climber education, the AAC will convene key voices, thinkers, educators, writers, to explore its historic vision of competent climbers and healthy landscapes. We are drawn to climbing because it provides adventure and fulfillment and uncovers the best in our partners and ourselves. The sport has grown significantly as the number of climbing gyms has increased and more people have access to the sport and lifestyle. As climbing transitions from its counterculture heritage in natural settings to urban and indoor environments, how does the climbing community build on its legacy as a foundation for inclusivity? What influence does social media, climbing gyms, coaches and the Olympics have on the way climbers transition from the gym to natural climbing landscapes? We're partnering with Camber Outdoors to open this dialogue; see their description for more information. In 2016, Melissa Arnot became the first American woman to summit Everest without supplemental oxygen. Rather than rest after this monumental achievement, she sought her next adventure. With a friend she set her sights on the speed record for summitting the highest point in each of the 50 states state - completing the challenge in just 41 days! Melissa will share stories and photos from a year of challenge, record setting and mentoring the next generation of explorers. Learn more about the 2017 Annual Dinner.